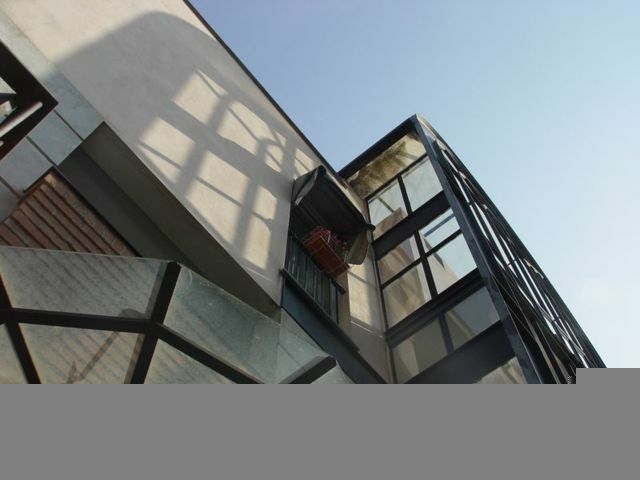 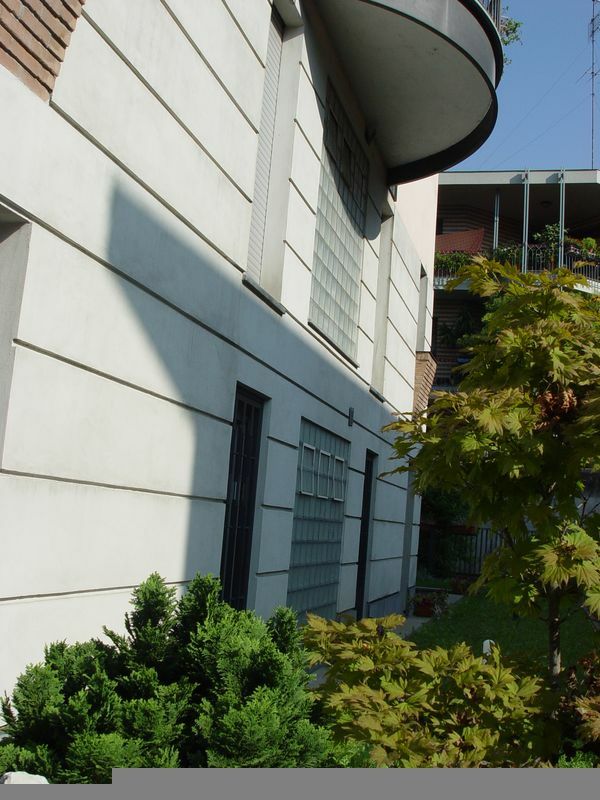 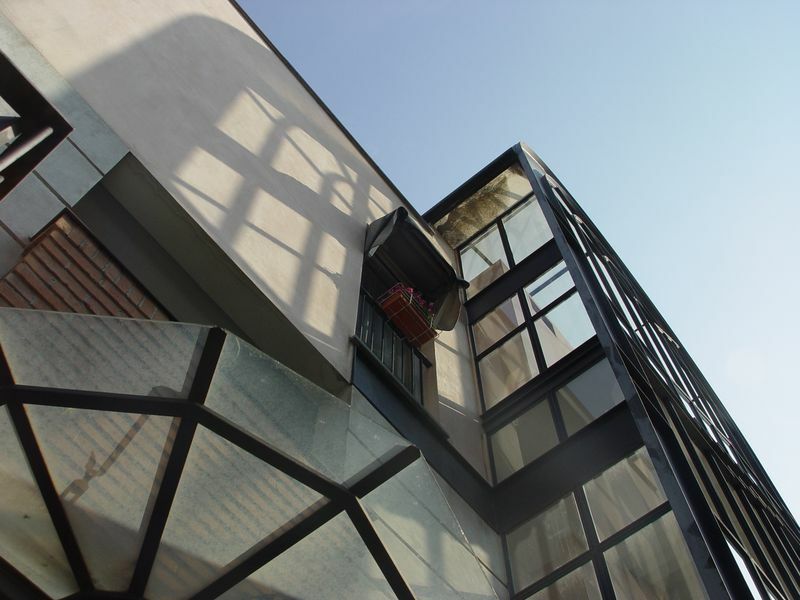 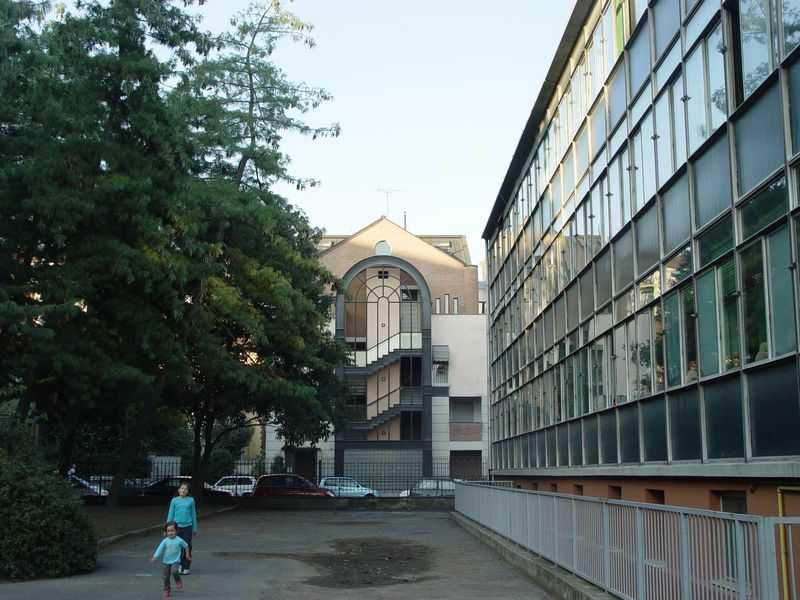 The building occupies a small residual lot (about 500 square meters) placed between a dense built area characterized by the presence of a plurality of architecturally heterogeneous constructions, dating from the late 50s and the following decades. 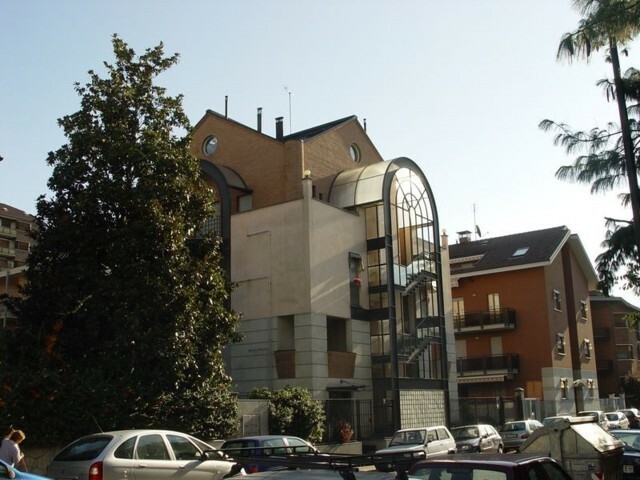 Cottage houses alternate with larger multi-storey buildings that characterize the built along corso Sebastopoli in the immediate vicinity. 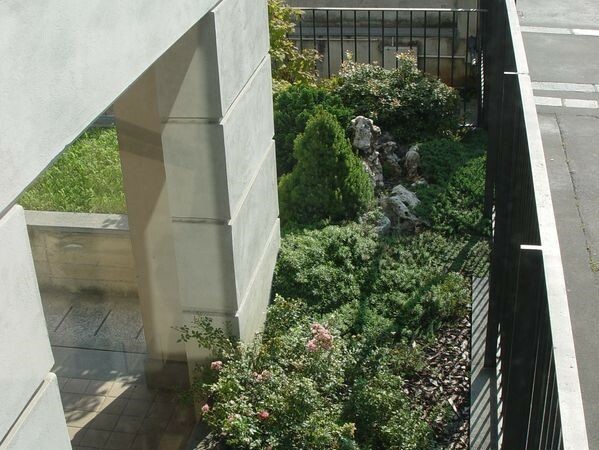 The front facing the street overlooks a green area destined to a park, belonging to the nearby municipal middle school, datable to around the end of the '70s. 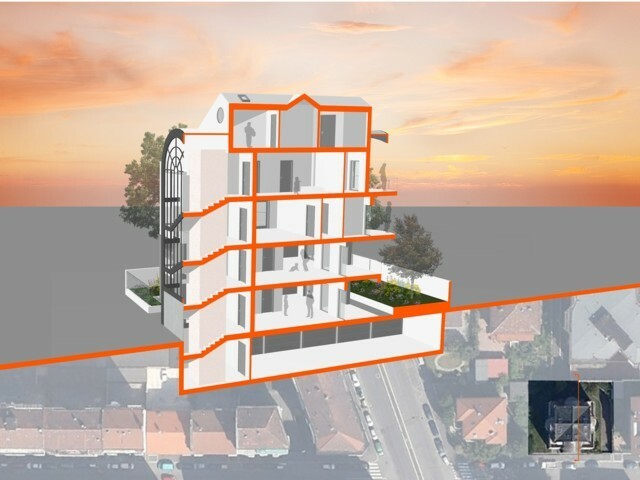 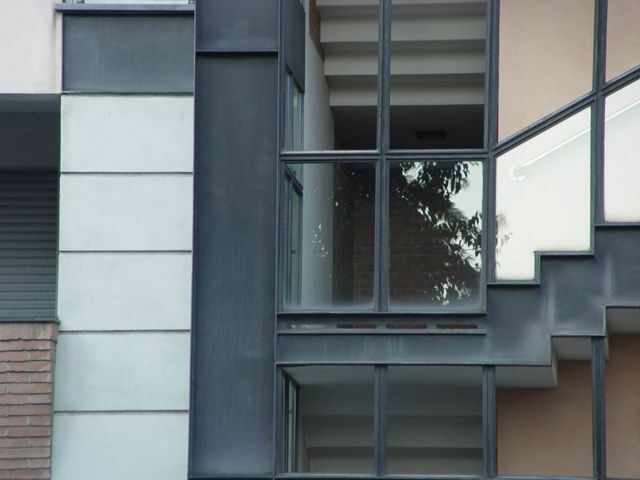 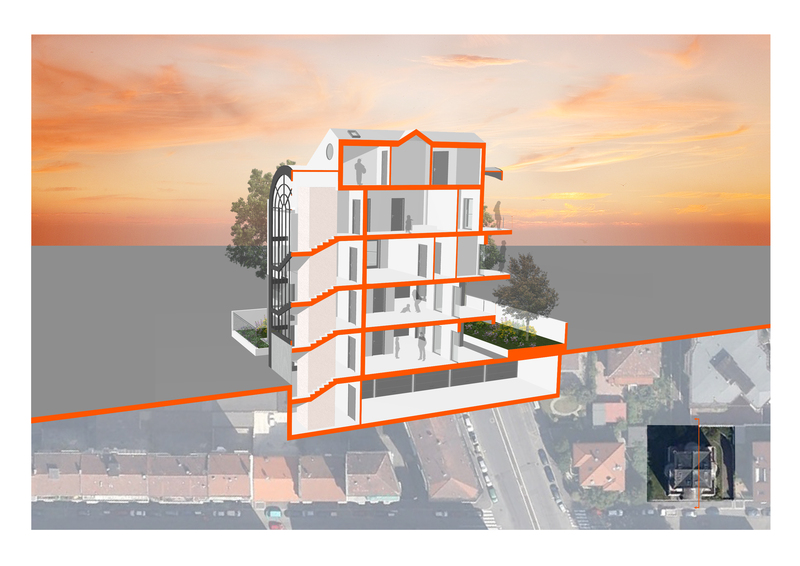 The project stems from the need, expressed by the building contractor, to modify the existing project - designed by another specialist - adapting it to the new demands of the real estate market and to the cogent building regulations, currently being redefined, awaiting final approval of the new PRGC. 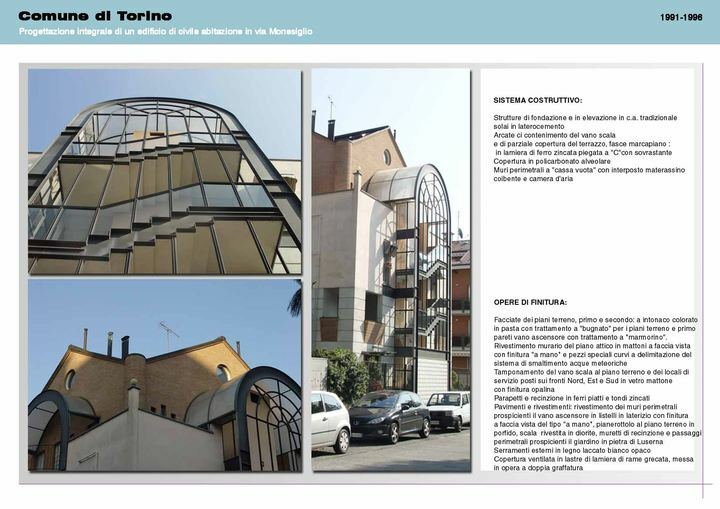 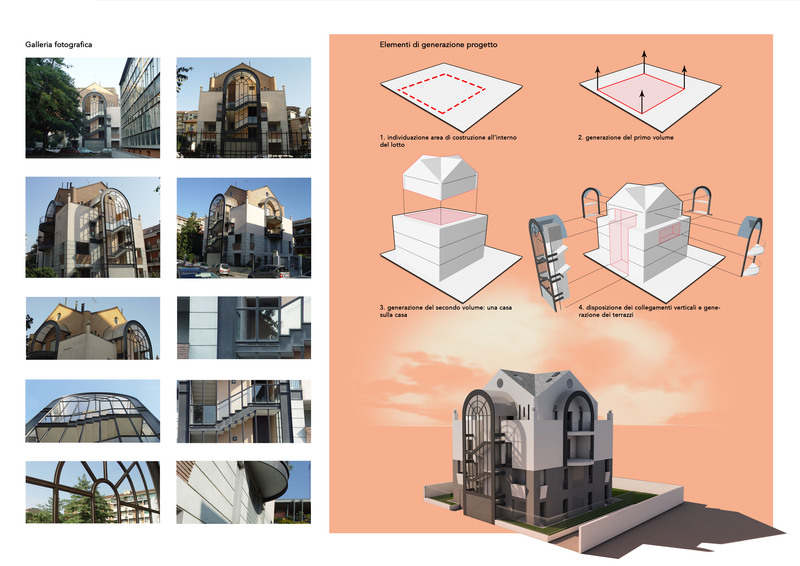 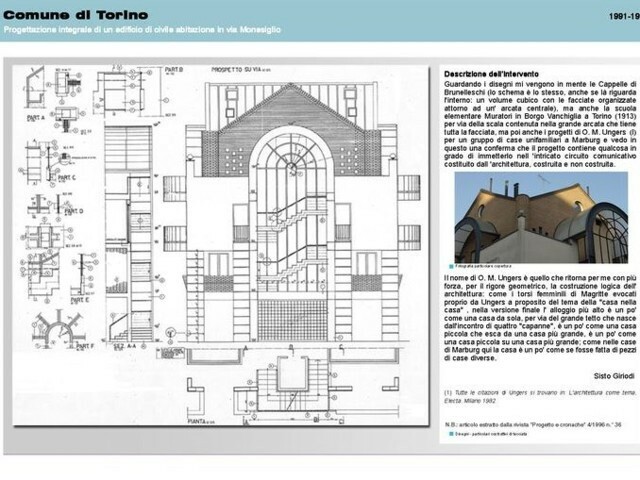 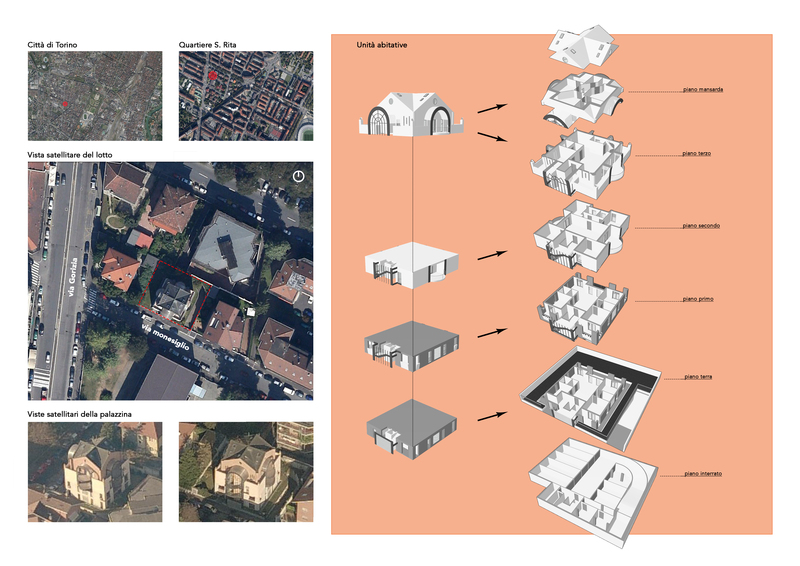 The "acrobatic" exercise of distributive and formal redesign applied to a volumetry and architecture already approved, was particularly complex and intricate. 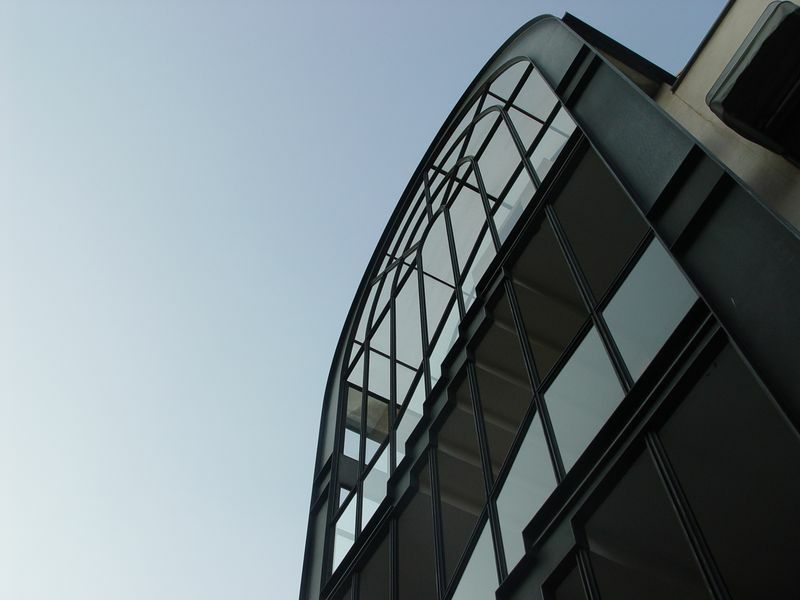 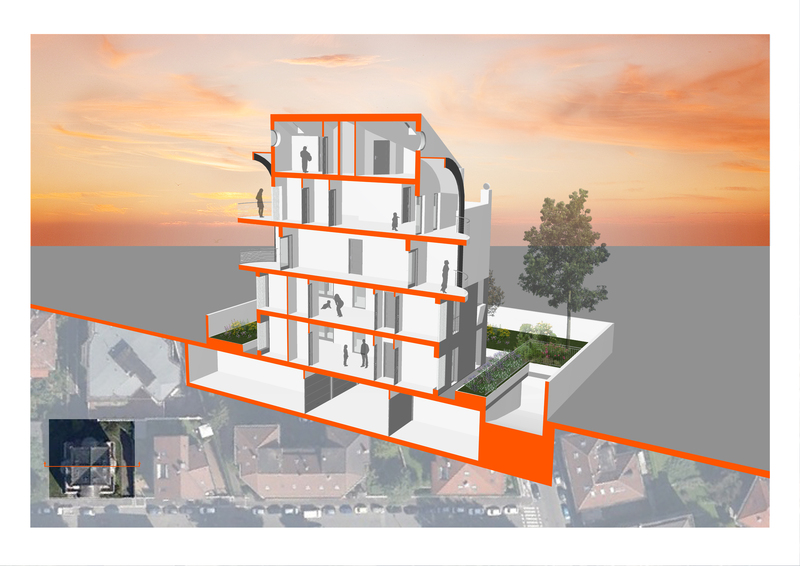 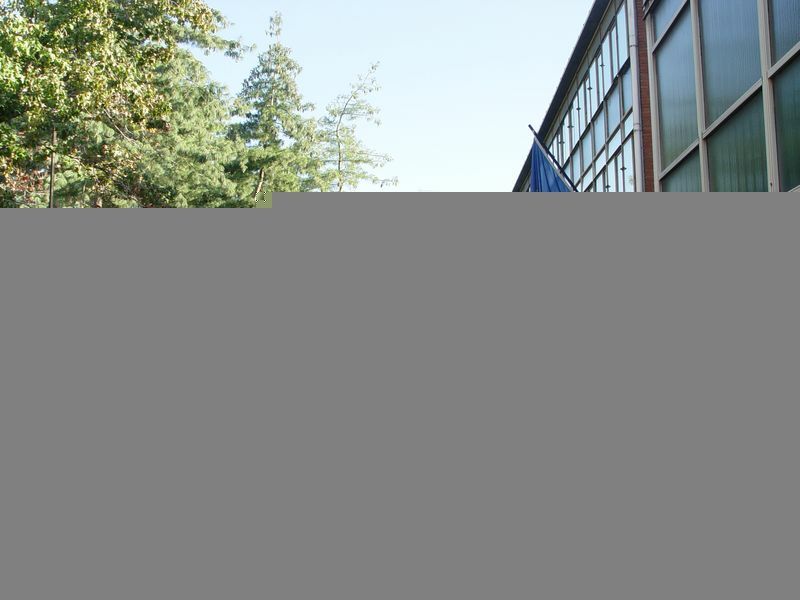 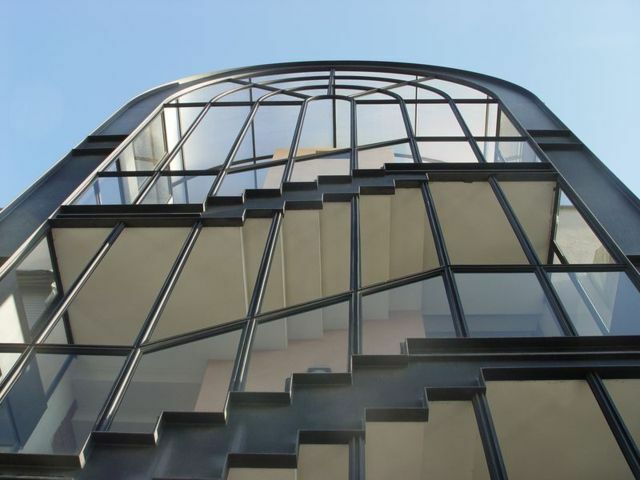 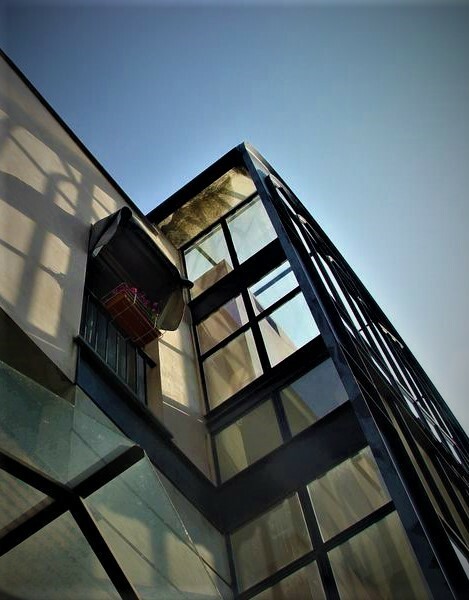 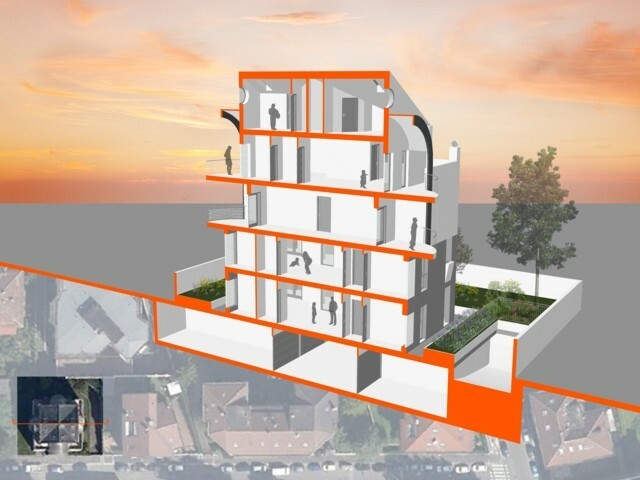 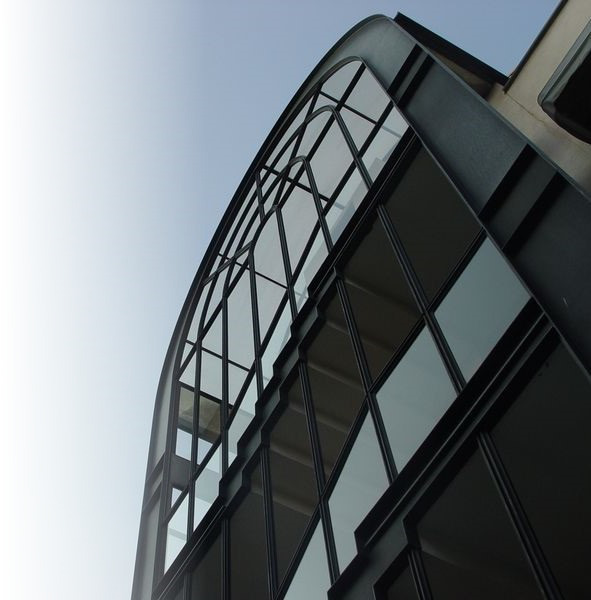 The idea behind the project was born from the need to place the stairwell outside the building to increase the volumetry, suggested by a careful reading of building regulations. 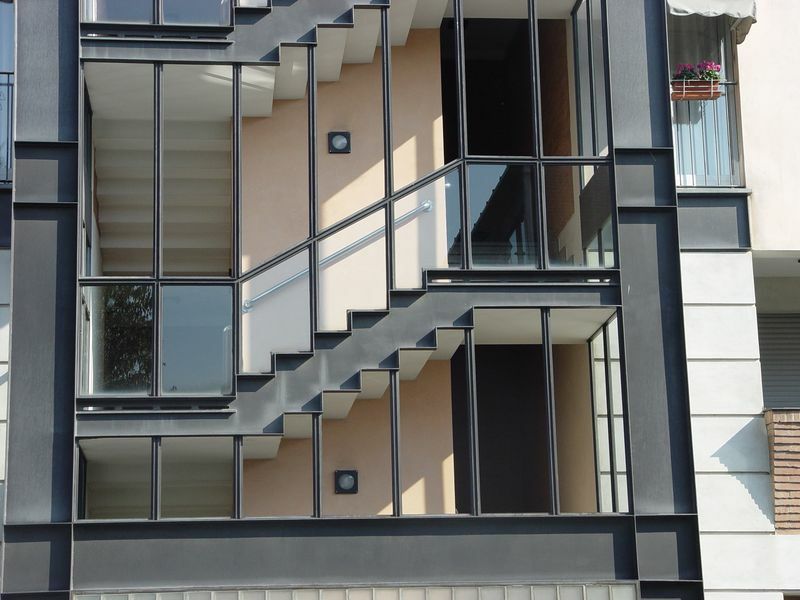 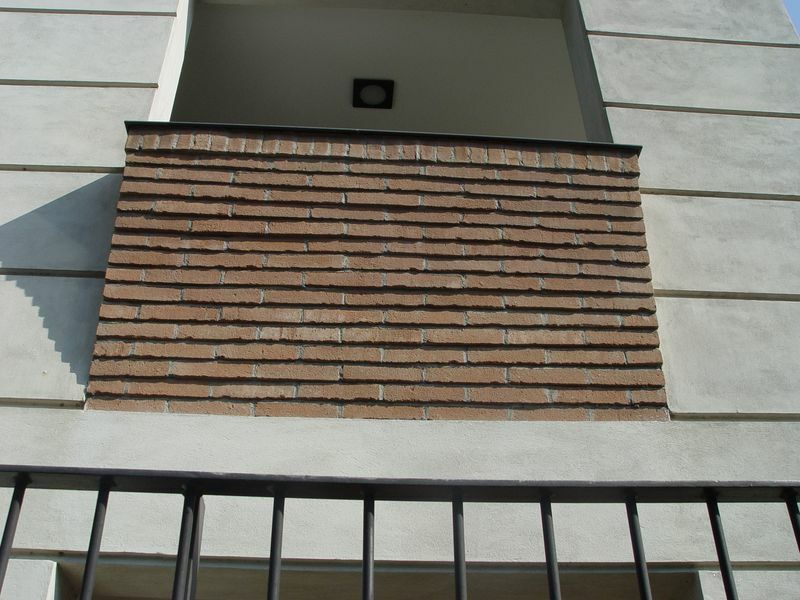 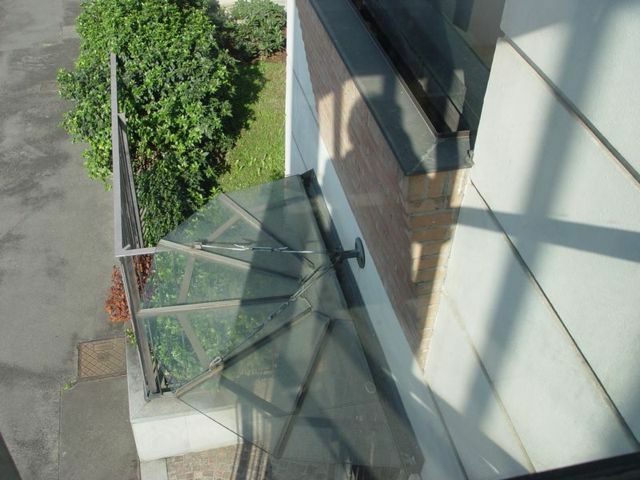 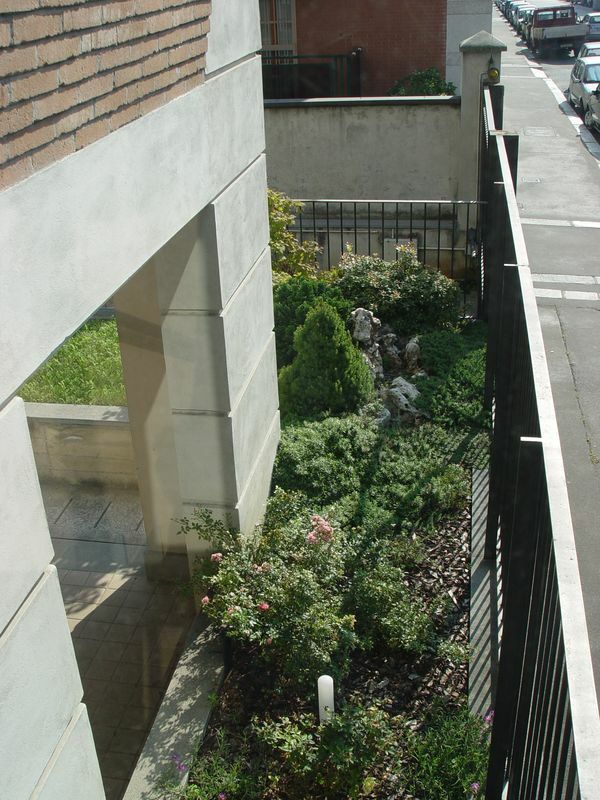 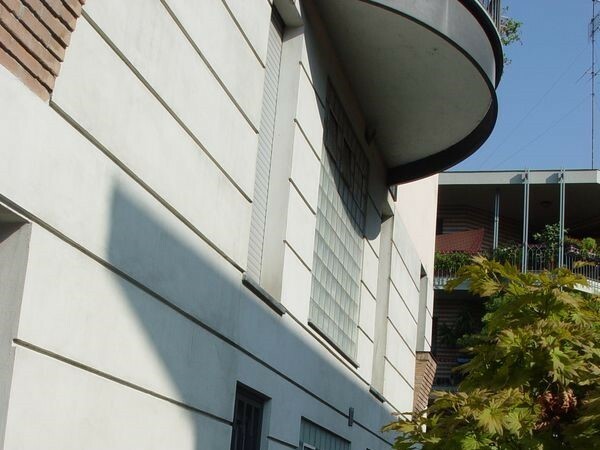 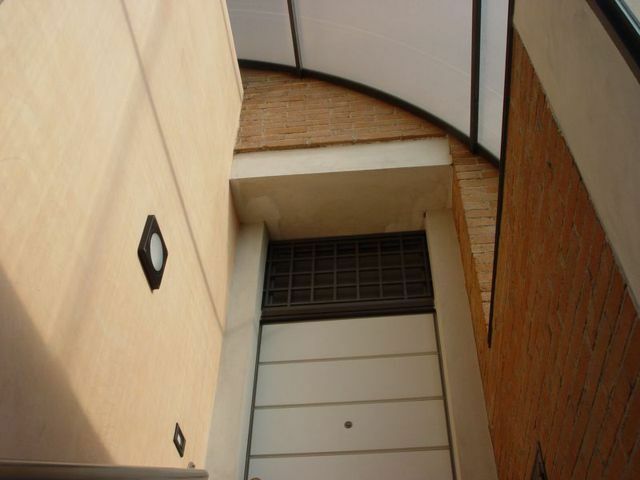 The vertical access routes to the real estate units have determined the development of the distribution aspects of each apartment, which vary on each floor. 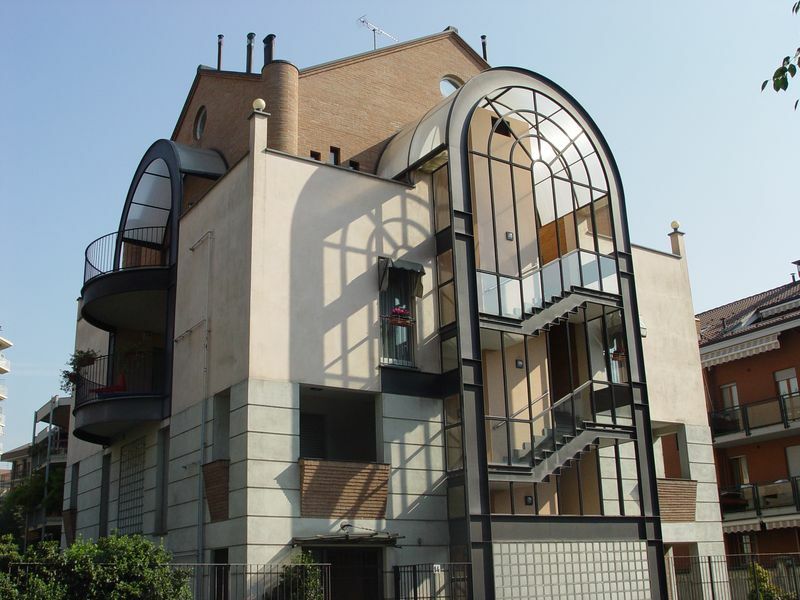 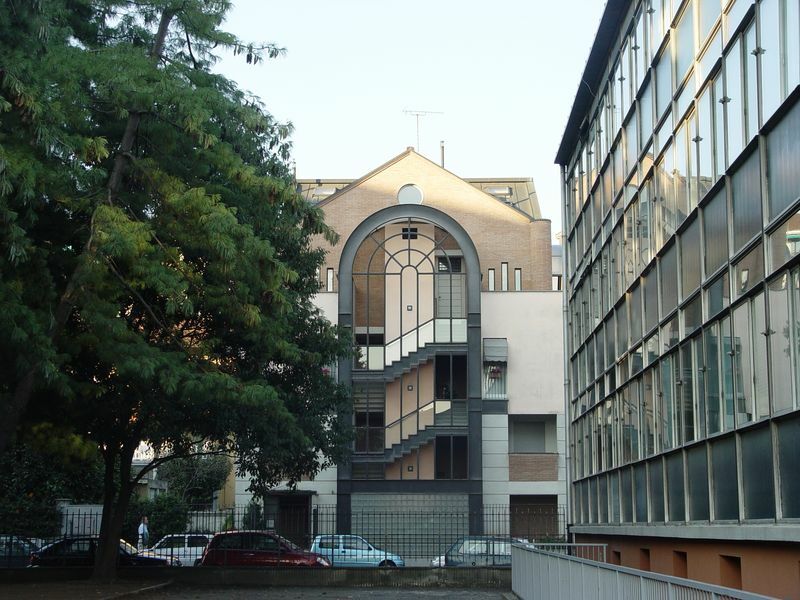 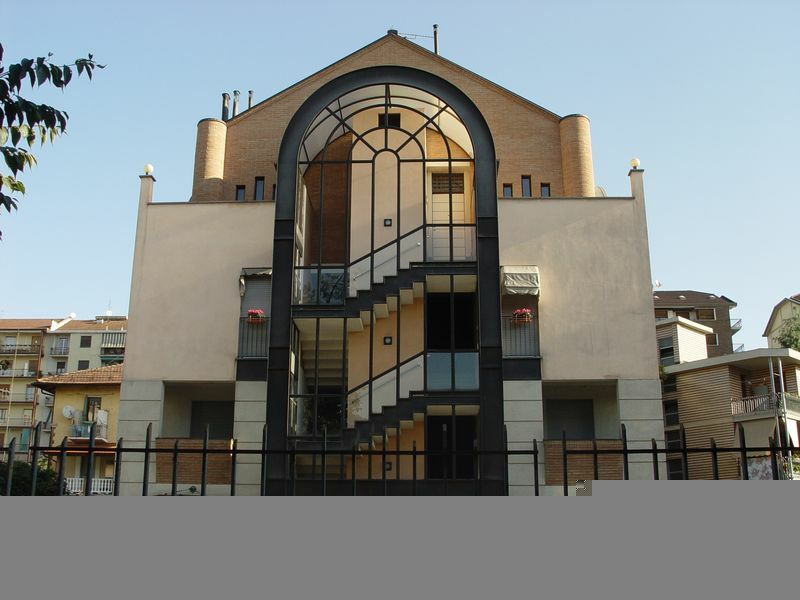 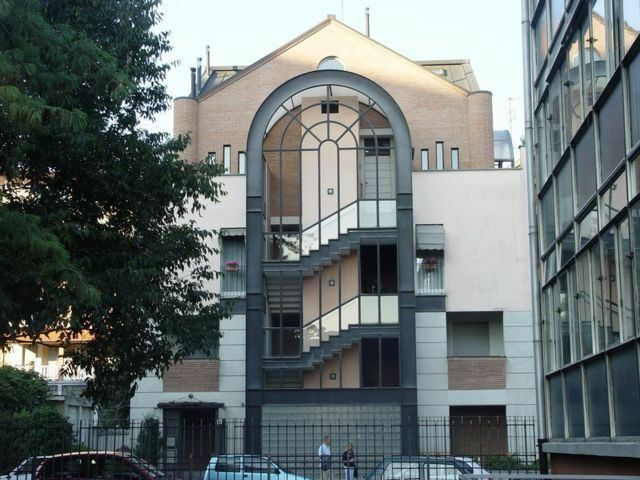 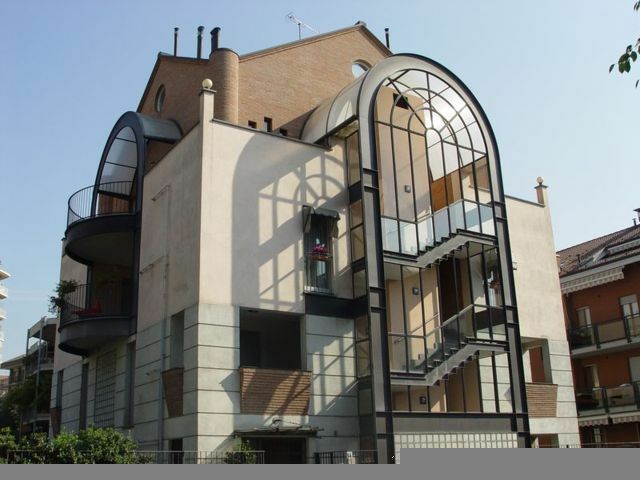 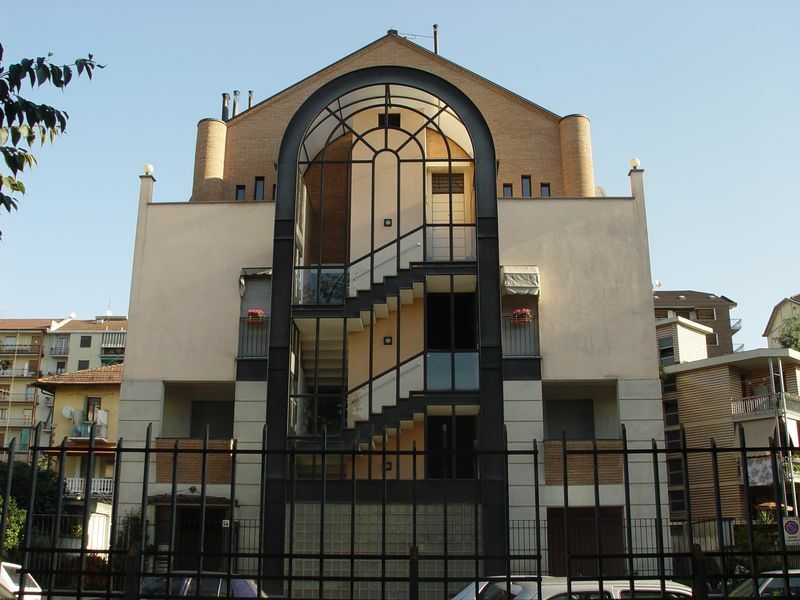 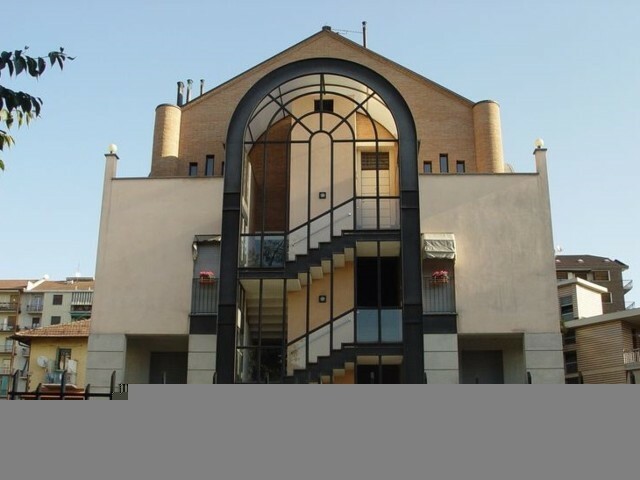 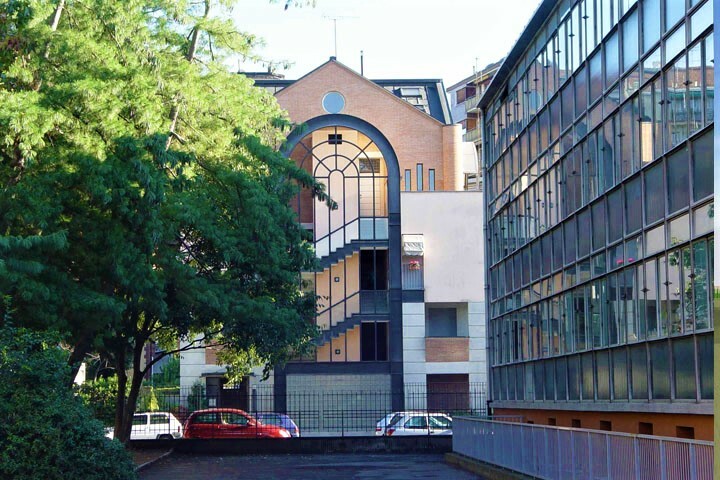 The overall image of the building, outlined by the presence of the large metal portal that encloses the stairwell, is characterized by the overlapping of simple volumes: starting from the ground floor that opens entirely towards the garden, to continue to the upper floors with the inclusion of the lodges and the symmetrical presence of large curved balconies facing the east and west fronts. 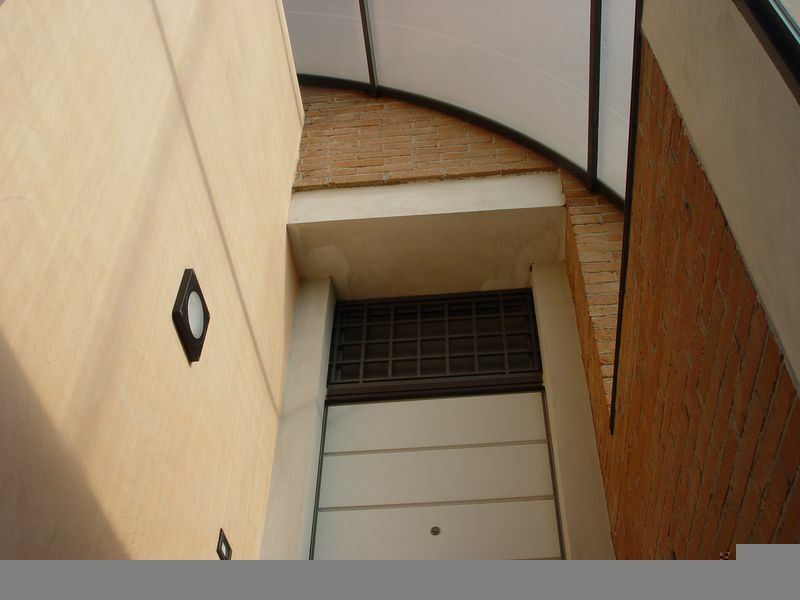 To crown the underlying “cube”, emerges the "materially" different volumetry of the attic floor with overhanging loft - entirely made of bricks - surrounded by the large perimeter terrace. 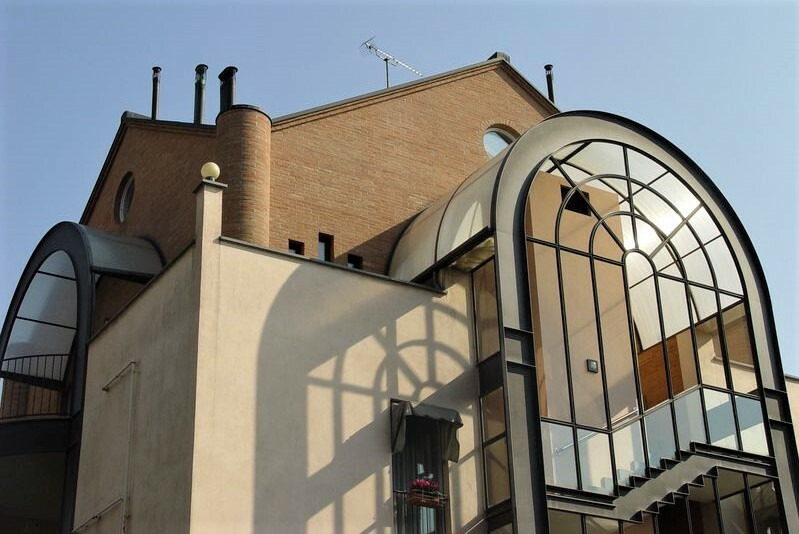 “It was Andrea Branzi in the '70s, when he made a name for himself as the enfant terrible of the artistic avant-garde with his 'radical architecture', to talk about the "..lost art of making beautiful homes.."; Branzi's words came back to me during the visit to the house, they kept coming back to me looking at the drawings, the finished ones but also the sketches, in which the trace of the work around the theme is preserved, clearly identified from the beginning. A first definition of the theme could be the "cadastral" contained in a word that has almost disappeared nowadays: cottage. 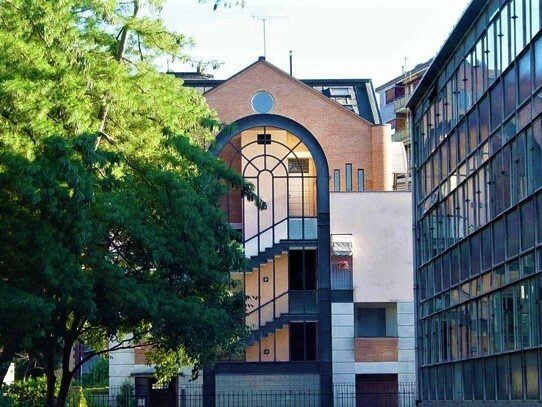 We no longer build cottages in the city, they were built up until the first half of the '900 in the new noble neighborhoods, and were a gym for architects who tried their hand at the art of making beautiful houses, beautiful plans, nice construction details. 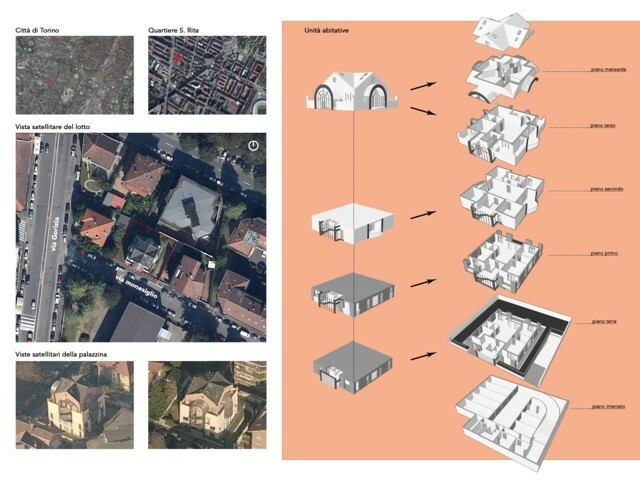 This house evokes in me the world of cottages and it invokes it for a reason: in fact, the block is mostly occupied by buildings surrounded by small gardens, a "green" character preserved also thanks to the presence of a school, made of low pavilions between trees. Unlike the most recent buildings of the '60s, however, this house does not look at the modern tall houses to produce a reduced and senseless version of them, but rather looks at the lost style of the cottage, without giving in to historicist nostalgia. 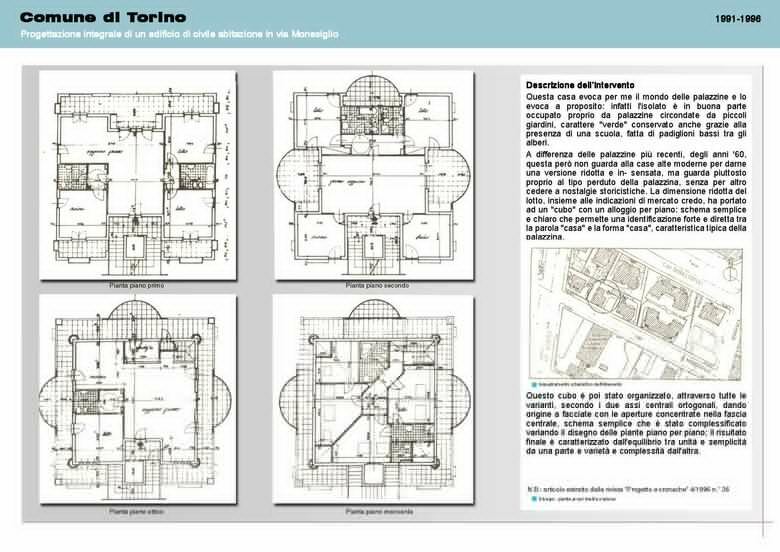 The reduced size of the lot, together with the market indications, I believe, has led to "cube" with one room per floor: simple and clear scheme that allows a strong and direct identification between the word "home" and the "home" form, typical feature of the cottage. 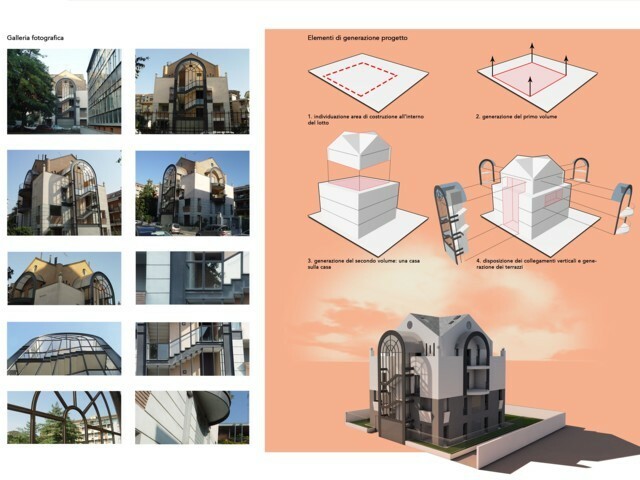 This cube was then organized, through all the variations, following the two central orthogonal axes, creating facades with the openings concentrated in the central strip, a simple scheme that was made more complex by varying the design of the plans floor by floor; the final result is characterized by the balance between unity and simplicity on one hand and variety and complexity on the other. 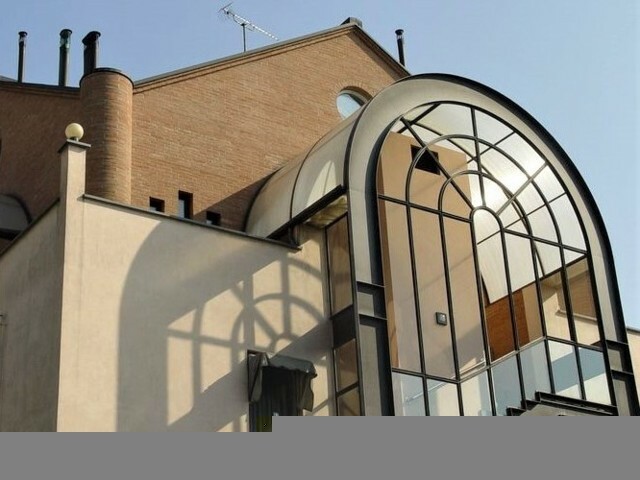 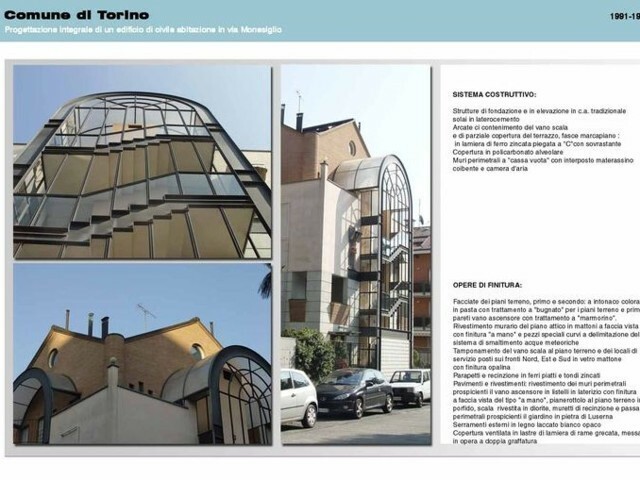 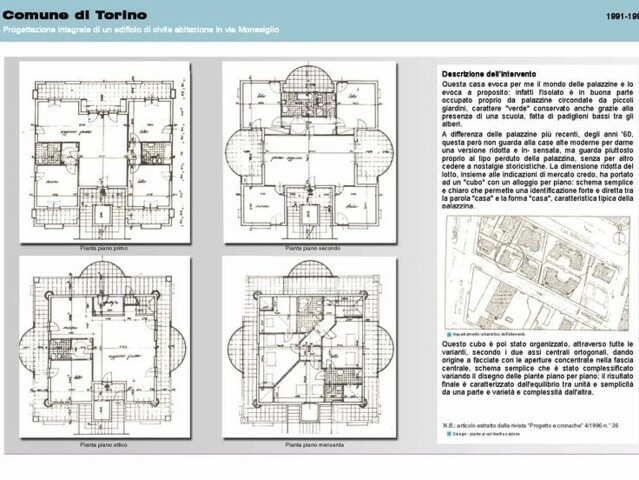 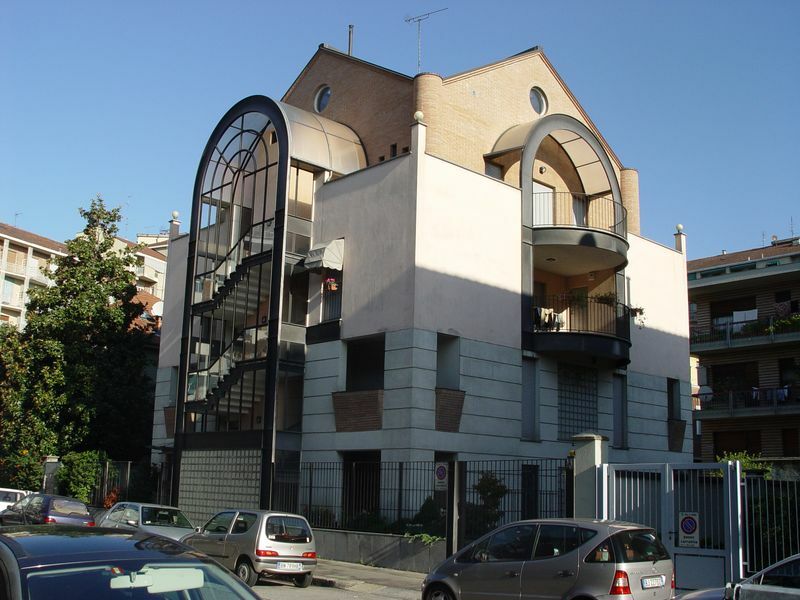 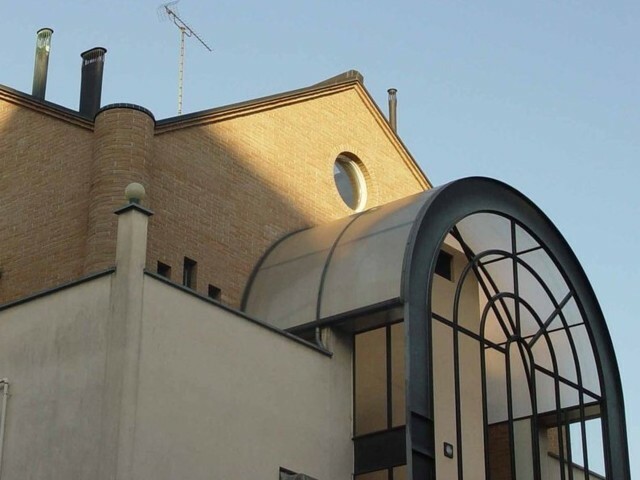 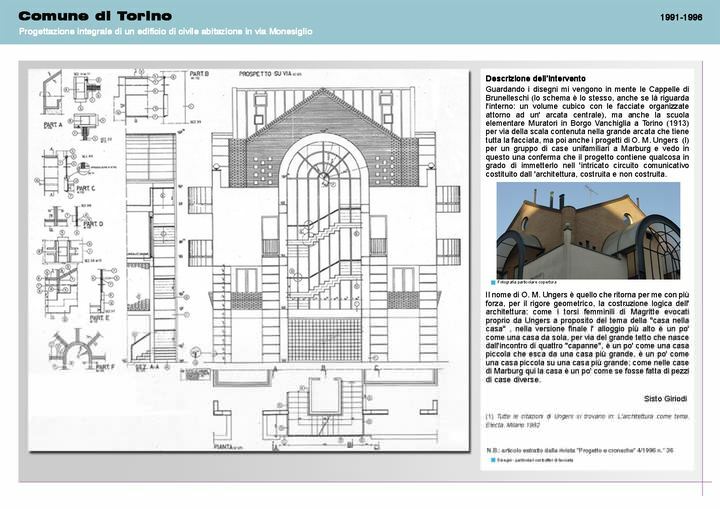 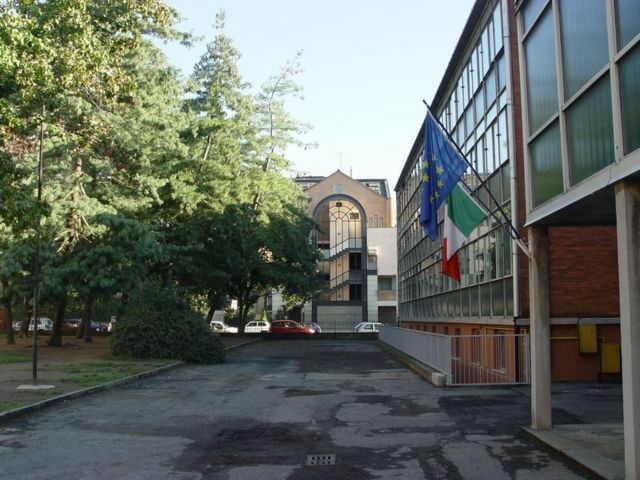 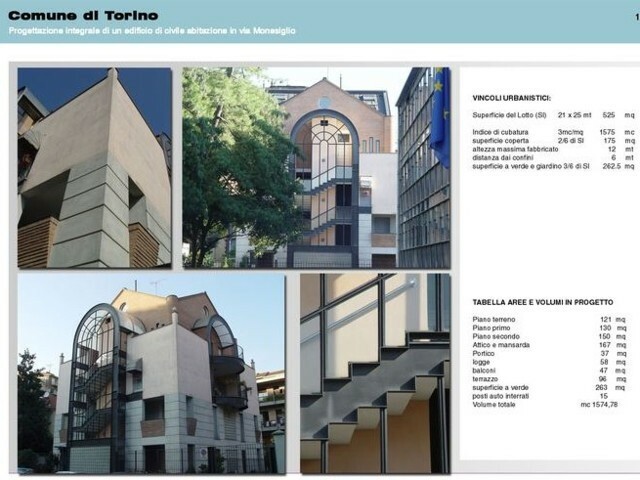 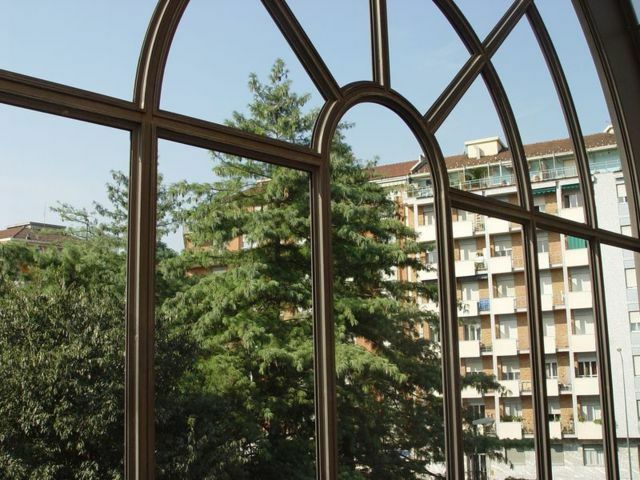 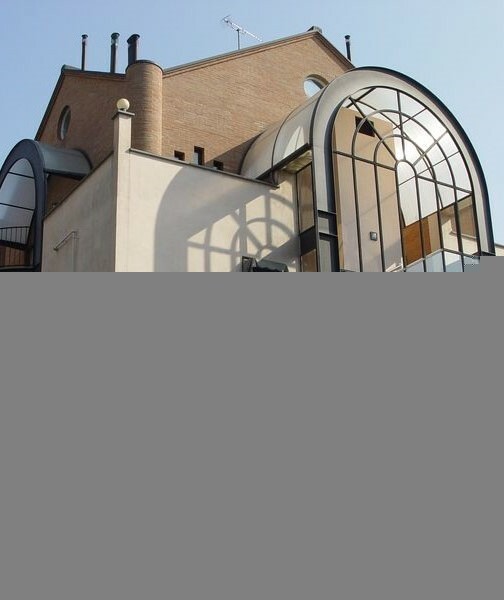 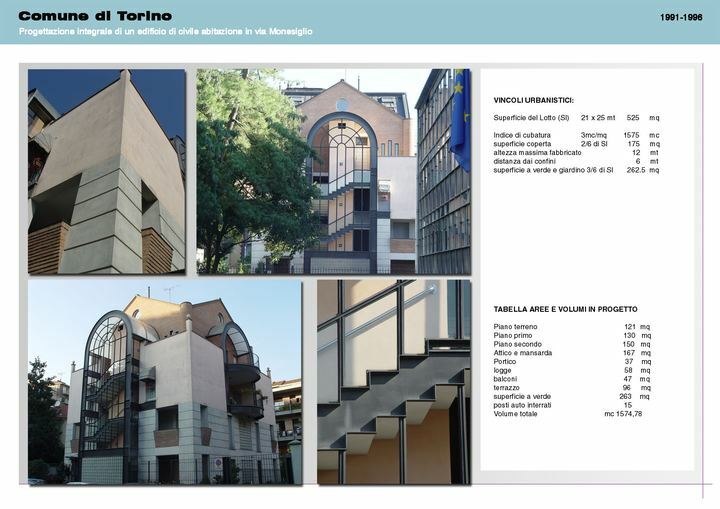 Looking at the drawings, the Brunelleschi's chapels come to my mind (the scheme is the same, even if it concerns the interior: a cubic volume with the facades organized around a central arch), but also the elementary school Muratori in Borgo Vanchiglia in Turin (1913) because of the staircase contained in the large arch that holds the whole facade, but then also the projects of O. M. Ungers (1) for a group of single-family houses in Marburg and I see in this a confirmation that the project contains something that can put it in the intricate communication circuit consisting of the architecture, built and not built. 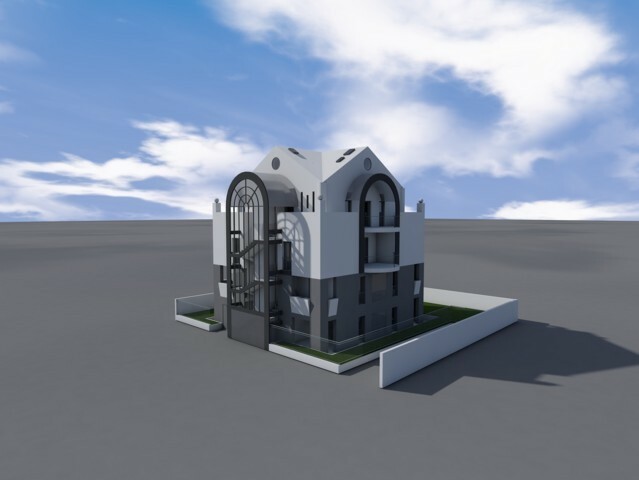 The name of O. M. Ungers is the one that comes back to me with more force, for the geometric rigor, the logical construction of the architecture: like the female torsos of Magritte evoked by Ungers regarding the theme of the "house in the house", in the final version the taller room is a bit like a house alone, because of the large roof that comes from the meeting of four "huts", it is a bit like a small house coming out of a bigger house, a bit like a small house on a bigger house; as in the houses of Marburg, here the house is a bit like it was made of pieces from different houses”.